What Day Of The Week Is July 24? 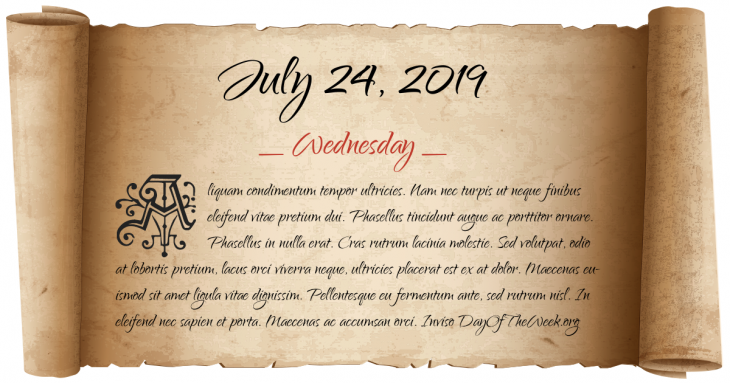 July 24, 2019 is the 205th day of the year 2019 in the Gregorian calendar. There are 160 days remaining until the end of the year. The day of the week is Wednesday. Citizens of Leeuwarden, Netherlands strike against ban on foreign beer. Antoine de la Mothe Cadillac founds the trading post at Fort Pontchartrain, which later becomes the city of Detroit, Michigan. the draft of The British Mandate of Palestine was formally confirmed by the Council of the League of Nations; and which came into effect on 26 September 1923. A fire at a home for the elderly in Pittsburgh, Pennsylvania kills 48 people. George Brett batting for the Kansas City Royals against the New York Yankees, has a game-winning home run nullified in the “Pine Tar Incident”. Democrat James Traficant is expelled from the United States House of Representatives on a vote of 420 to 1.
Who were born on July 24?